Garrett Neese/Daily Mining Gazette Michigan Technological University assistant professor Angie Carter, center, introduces the semester-long project from her Communities and Research class, which included students Courtney Archambeau, left, and Jack Wilson. HOUGHTON — Whether because of money or transportation problems, many people in the Upper Peninsula have trouble finding fresh, nutritious food. 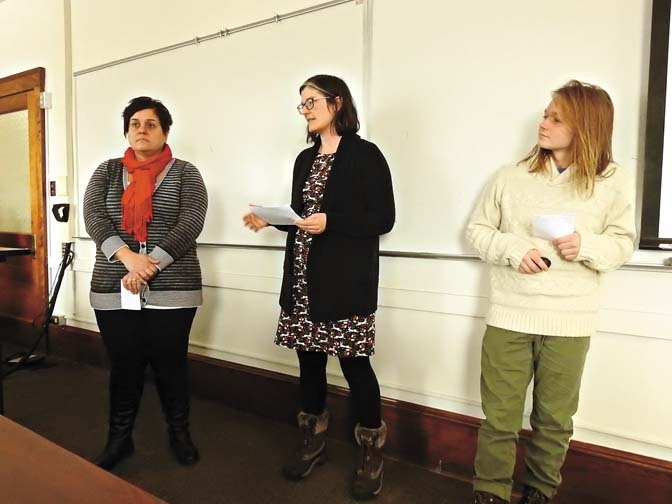 Students from Michigan Technological University assistant professor Angie Carter’s Communities and Research class presented their semester research project Friday at the Social Sciences Brown Bag forum. The project looked at food access in Houghton, Hancock and Michigan Tech. “As community members, we all have a vested interest in the food system of the surrounding area,” said student Courtney Archambeau. In compiling their report, students looked at existing research, conducted interviews and a focus group, and toured sites such as the Ryan Street Garden in Hancock. The class conducted the project in partnership with the new Western U.P. Food System Council, a collaboration including the Keweenaw Bay Indian Community, Michigan Tech, the Western U.P. Planning and Development Region, Western U.P. Health Department, farmers, business owners and civic leaders. It covers the four-county area as well as Gogebic and Iron counties. The council looks to tackle the problem of access to food through coordinated action at the local level. Recent figures show about 3,800 people in the six-county area in immediate need, classified as people below the poverty line but not receiving assistance. The more than 2,500 in Houghton County far outnumber those in counties, which students said may owe to the inclusion of Michigan Tech students in the figure. Other people in the Upper Peninsula have also found it difficult to obtain healthy foods. In a needs assessment survey done by WUPHD, 34.5 percent of people felt there is a lack of access to healthy foods in the area, such as fruits and vegetables. Recommendations from the class include creating an information repository for food assistance or local food growers, as well as developing food programming and workshops. “It shouldn’t be so much a lecture or a nutritional guide, but more of a conversation that meaningfully engages with people and takes their experiences into account and speaks to their needs,” Wilson said. The class’s project was geared toward Houghton/Hancock. But Jack said the project could be be replicated throughout the six-county area. The group is completing what will be a roughly 70-page report, which will be available Thursday at the Western Upper Peninsula Food Systems Council website, wupfoodsystems.com. The council will be working on mission and vision development throughout 2019, said member Rachael Pressley, assistant regional planner with the Western Peninsula Planning & Development Region Commission. The goal is to create a collaborative effort for the process. “Really, the direct goals need to be made by the people who are participating themselves,” she said. The council is working to acquire grants for several proposals. Those include setting up a composting program and a food hub feasibility study to identify the physical infrastructure that will meet the community’s food needs. Carter’s class will share more about its findings at the second Western Upper Peninsula Food Systems Council meeting at 5:30 p.m. Thursday at the Zeba Community Hall.